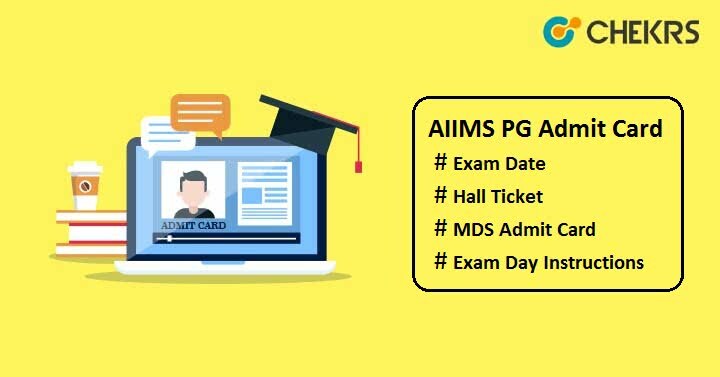 AIIMS PG 2019 Admit Card: All India Institute of Medical Sciences (AIIMS) offers admission to various UG & PG Medical courses such as MBBS/ BDS/ MD/ MS/ DM/ MCh/ DM (6 years)/ MDS. Read the article carefully to know the information related to How to download Admit Card, Exam date, dos & don’ts. Admission Notification for PG courses in various AIIMS medical colleges is released by AIIMS, New Delhi. Candidates seeking admission for medical PG courses can apply for AIIMS PG. AIIMS provides admission through entrance exam. Download your Hall Ticket through online mode to be able to participate in an entrance exam. Search for AIIMS PG Admit Card 2019 download link on the home page. Enter the required details and then submit it. “AIIMS PG 2019 Hall Ticket” will display on your screen. Check all the details written on the e-admit card. Download the hall ticket and then take the printout of it for future use. The admit card is used for candidate’s identification. It contains details like candidate’s name, candidate’s photograph, roll no., application no., date of birth, father’s name, course name, exam center & its address etc. All the details printed on the admit card must be correct. In case of any discrepancies, must report to the Assistant Controller Examinations, AIIMS, New Delhi. The hard copy of Admit card will not be sent to any candidate’s postal address. So must obtain it from the official website. Report to the allotted examination center on time mentioned on the admit card. Must bring your print copy of admit card to the examination center along with valid identity proof (Aadhaar card, Voter ID card, Driving License, PAN card, Passport) and one passport size photograph (same as used for uploading at the time filling online application). We hope this article will be helpful for you. For any sort of query, please write in comment box below.